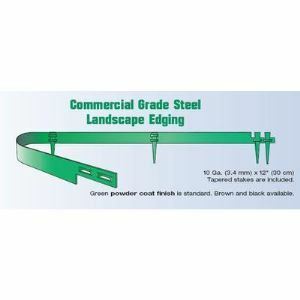 Collier Metal Specialties, Inc. -1011 Commercial Landscape Edging - 10' x 1/8" x 4"
1011 Commercial Landscape Edging - 10' x 1/8" x 4"
Green, Brown or Black powder coat finish is standard on all edging products; Unpainted (Raw Steel) is also available. A Galvanized finish is available on the 14ga, 12ga and 1/8" material and a Hot Dipped Galvanized finish is available on 3/16" and 1/4" edgings. Galvanized and Hot Dipped edging products are not available powder coated. Call for specific pricing. To allow for 8" overlap: divide # of feet needed by 9.33 to obtain the # of 10&apos; pieces needed. For example if you have 150&apos; of installation length you will need to divide the 150&apos; by 9.33 which equals 16 - 10&apos; pieces needed. 12" Stakes included 1/8" 4 17 lbs.